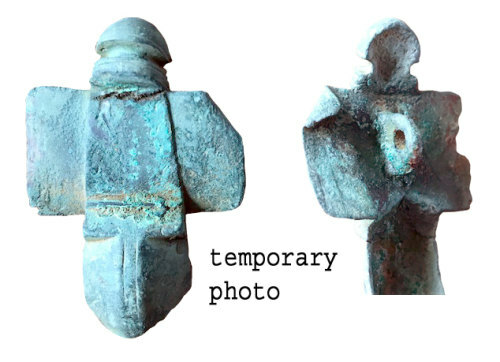 An incomplete Early Anglo-Saxon copper alloy cruciform brooch of Martin's (2015) Group 2 or 3 dating to the period c. AD 475 - 550. Only the headplate and upper bow survive. The headplate is rectangular and divided into three smaller panels. The central panel is brought forward from those flanking it. The brooch has a half-rounded and collared knop at the top, which has been cast integral to the headplate. A single loop for the pin is located on the reverse. The upper bow is arched, and faceted at top and bottom. The lower part of the brooch is missing.